Hello there! Today’s recipe is a wonderfully delicious and easy-to-make quick bread that only has nine ingredients. It also has no eggs, no butter, is refined sugar-free and is coincidentally vegan too. I didn’t mean to make that happen, but it did. The resulting bread has a satisfying crispy crust that’s almost toasty in flavour and a dense, yet tender inside dotted with creamy dates pieces and crunchy walnuts in a sweet (but not too sweet) banana bread. 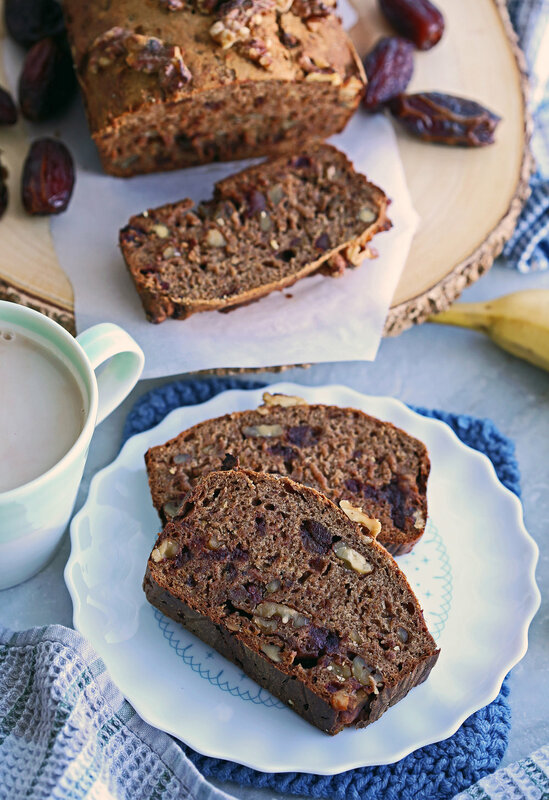 The Medjool dates give this bread a scrumptious rich caramelized flavour that you need to try! 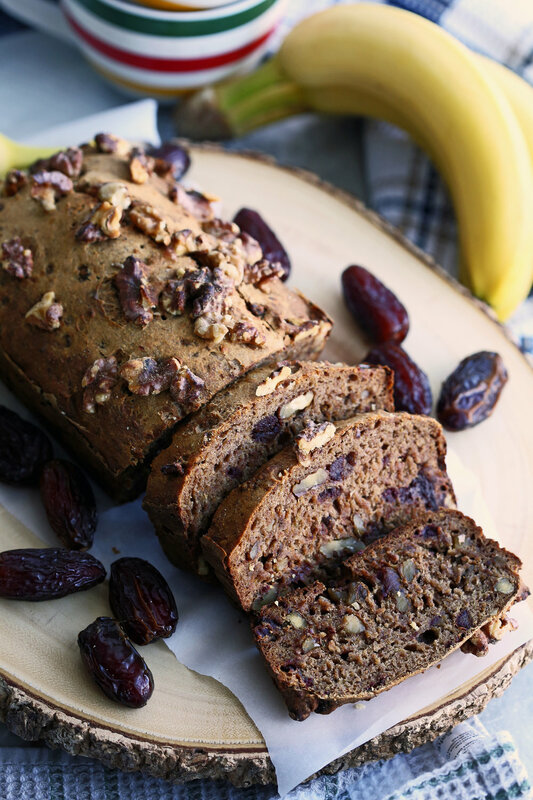 I hope you enjoy this recipe for Date Banana Nut Bread! 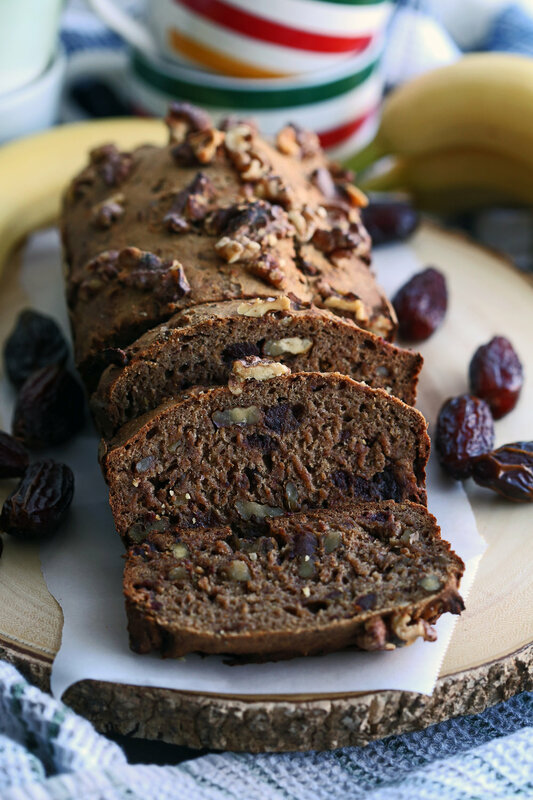 How to make this make this banana bread? Place the Medjool dates into a food processor and blend until it forms a soft paste. Full ingredient amounts and complete instructions listed in the recipe card down below. Stir together the date paste, mashed bananas, and hot water together until well combined. In an another bowl, whisk together the dry ingredients until well-distributed (not shown). Add the banana-date mixture to the dry ingredients and whisk to combine. Tip: Whisk until just-combined (no more dry ingredients can be seen). Over-mixing may result in a tougher bread. Fold in the walnuts and then place it in a parchment-paper lined loaf pan. Top with extra walnuts. Bake at 350 degrees F for 60-75 minutes until a wooden skewer (or cake tester) comes out clean. Note: The bread cracks slightly on top. I covered some of it with walnuts (because I was poking that area with a skewer to test for doneness), but it looks great either way. Looking for more desserts made in a loaf pan? Check out these two! Strawberry Lemon Yogurt Quick Bread: This bread is fluffy, full of lemon flavour, and loaded with delicious fresh strawberries. Classic Lemon Blueberry Loaf Cake: A family favourite! It’s full of bright, tart lemon and sweet blueberry flavour! It’s also been shared on Pinterest over 54,000 times. Yay! Is easy to make: There are only nine ingredients! Vegan and refined sugar-free: Perfect for those with these dietary requirements. Is yeast free so you don’t need to proof the dough: No proofing means saving time because you don’t need to let the bread rise first. Uses ingredients that are usually easy to find at your local grocery store or are pantry staples. Is simple to put together: It takes around 10 minutes to put this loaf bread together. The majority of time it takes to make this banana bread is spent baking in the oven. Is shareable and portable: Share it with family, friends, or take it to work to share or eat as a snack. Is great to have for breakfast or dessert too: Serve it with a hot cup of coffee or tea or with a glass of milk. Preheat the oven to 350 degrees F. Line a 9x5 loaf pan with parchment paper. Place the dates in a food processor fitted with an S-shaped blade. Blend until the dates break up and form a soft paste. Place the date paste along with the mashed bananas and hot water into a medium bowl. Using a wire whisk, stir well to combine. Set aside. In large bowl, whisk together the dry ingredients: flour, baking soda, baking powder, and salt until well-combined. Add the date-banana mixture to the dry ingredients. Whisk until combined (you can no longer see the dry ingredients). Then using a spatula, fold in the chopped walnuts until distributed throughout the dough. 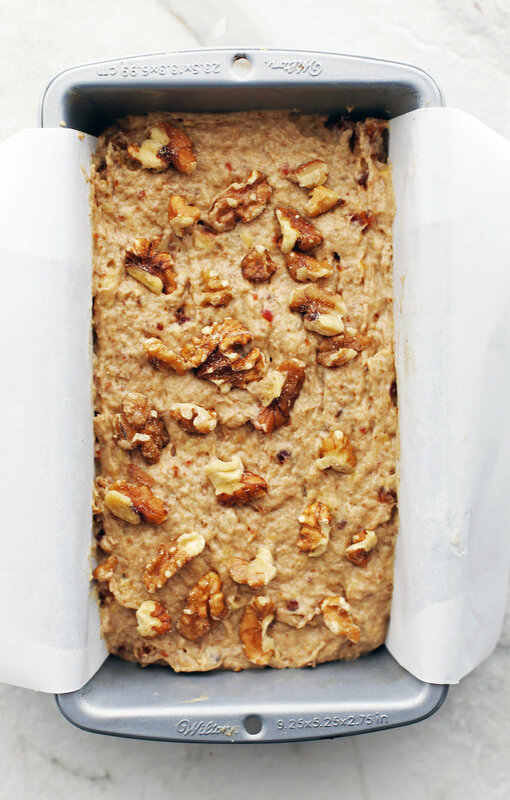 Spread the dough evenly into the loaf pan and sprinkle with more walnuts on top. Bake for 60-75 minutes until a wooden skewer (or cake tester) comes out clean in the center. Let the bread cool slightly in the loaf pan before eating. Best enjoyed warm. Store cooled bread tightly wrapped with plastic wrap or place in an airtight container at room temperature or in the refrigerator for up to a week. Nutritional information represents one slice of bread for a total of twelve slices.